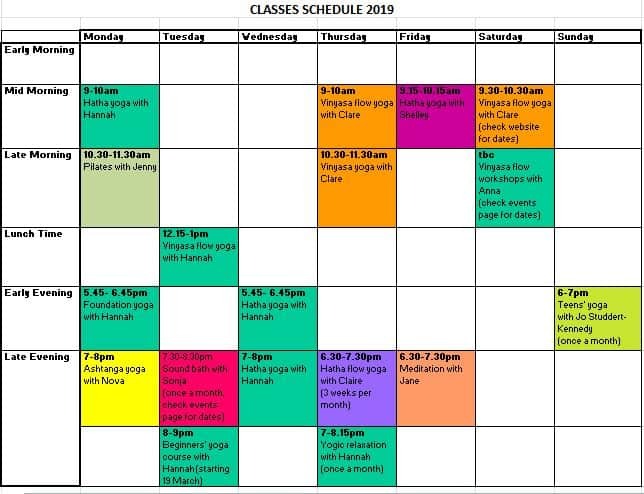 £10 for all classes. You do not have to pay in advance – simply pay our instructors on the day. Which you choose depends on your experience, your fitness and what you want from the session – plus, of course, whether you like the style of the class! It is advisable to book in advance to avoid disappointment… Just click on the links below to secure your place. Ashtanga with Zoë is a wonderfully dynamic practice! Taught in classical sequence encompassing physical asana practice with bandhas, philosophy, chanting and breath work. Zoë is a free spirit with a love for body art and spiritualism. Join her on the mat for a heady, vigorous yoga practice coupled with soft, beautiful chanting and feel the magic flood the mind during relaxation afterwards. Suitable for: anyone who is reasonably fit and wants a physical challenge, plus those who would like to extend their yoga practice by focusing on precision in their asanas. This is one of the traditional forms of yoga practice, from which other types have originated. Using a combination of asanas (poses) and controlled breathing, it is as physically demanding (or not) as you make it. Classes start with sun salutations (surya namaskars) and finish with savasana relaxation. Based on the principles of hatha yoga, foundation yoga is just that: postures that create the foundation of your yoga practice. This class is perfect for those who want to strengthen their core yoga practice, those who are new to yoga or returning after a long time off and those who fancy the idea of yoga but haven't a clue what it involves. With the instructor giving plenty of alignment cues and corrections, you will feel your yoga practice growing stronger each week. We will work on physically strengthening our bodies but also strengthening the mind with the use of pranayama (breathing techniques) and meditation/relaxation. A dynamic, physical class, taught in classical sequence encompassing physical asana practice with bandhas, philosophy, chanting and breath work. Our ashtanga is vigorous yoga practice coupled with soft, beautiful chanting, culminating in relaxation.